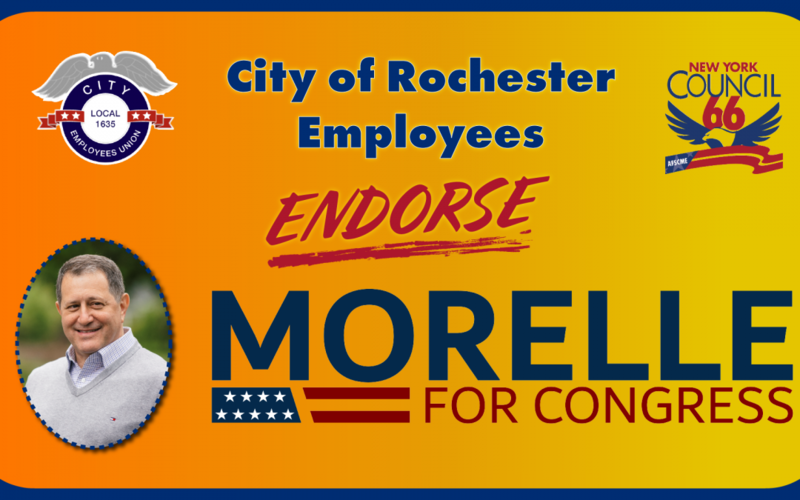 Today, Joe Morelle announced that the City Public Employees Coalition (CPEC) has endorsed his candidacy for the 25th Congressional district. The CPEC is comprised of five unions in the City of Rochester, including: Board of Education Non-Teaching Employees (BENTE) Local 2419, Rochester Teacher’s Association (RTA), Rochester Police Locust Club, International Association of Firefighters Local 1071, and the American Federation of State, County, and Municipal Employees (AFSCME) Local 1635. Both Local 2419 and Local 1635 are affiliated with AFSCME Council 66. Morelle, who currently serves as a state Assemblymember representing the towns of Brighton, Irondequoit and parts of the city of Rochester, has spent a lifetime in public service working to advance the best interests of his community. In the Assembly, Morelle has successfully fought for the passage of legislation to raise the minimum wage in New York State, establish paid family leave to ease the burden on our working families, improve access to healthcare for all people, bring millions of dollars in infrastructure improvements to our area, and increase workforce development training to ensure individuals have the skills and training they need to be successful.